Hello darlings! For those of you surviving these East Coast summers--more power to you!! I don't know how people could ever survive these things! Seriously, me and my wardrobe are not built for this heat and humidity! That has lead me to create light weight comfortable looks that still protect my skin during those 100% humid days! 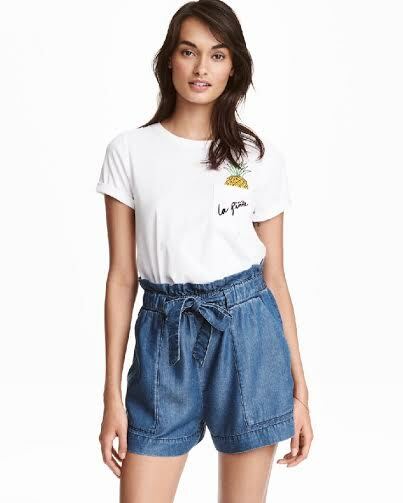 I found these great high-waisted shorts at H&M with a tie waist and flirty detail around the waist! They come in several colors so I decided to go with the maroon so I could wear them into fall with black tights! I paired it with one of my favorite 3/4 length sleeve black shirt (on sale now!!) which is great for nights out or for Summer Friday's in the office! Enjoy!